At least for the moment, the only clearly obvious change in this update is in the overflow menu for posts. 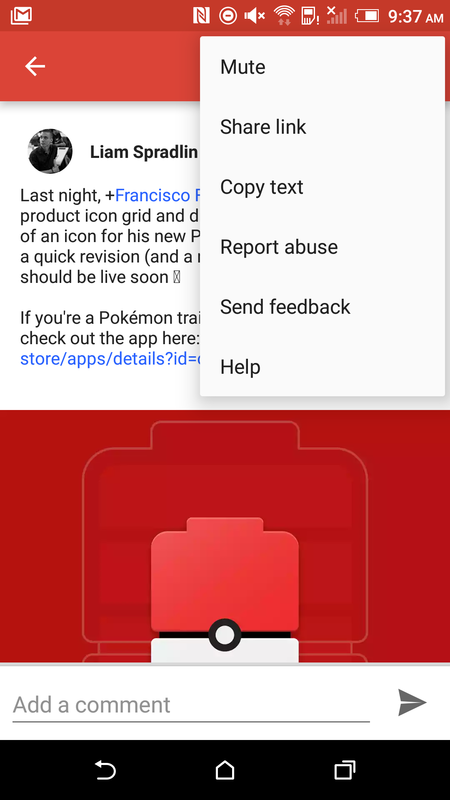 The 'Send feedback' and 'Help' commands have been removed. There was probably no real need to have them there, so this won't have much impact on us. Nevertheless, it was a change worth mentioning. We'll update this post with a more official changelog if one is posted later. Images are a huge part of social networks, they add color and life to otherwise dull blocks of text. Google+ users in particular seem to love animated gifs. For that reason, it has always felt like a missed opportunity that only an original post could contain images, but the following comments were limited to text. It looks like that won't be the way for much longer. A pair of new strings suggest we can look forward to posting images in the comments of other posts. There's not much to be said about either string. The first will probably be used as a placeholder in parts of the interface where an image wouldn't be appropriate, like in the notifications list or in the small space available to individual comments below posts in the stream. The second line is obviously just a status message that shows up while an image is uploading. This might not seem like a big thing to some people, but quite a few people have been asking for image comments for about as long as Google+ has been open to the public. It's not currently clear if users will be able to make comments with both text and images, or if the two will have to be separate. It's hard to judge when image comments will become active. It looks like there are at least a few important pieces missing, like the basic pieces for the button users will tap to attach an image and an updated layout for comments that could contain the posted image. However, once this does begin to roll out, I would expect it to occur in stages. I'm also going to predict that the "classic" web interface may not support images in the comments, which may finally force many of us (i.e. me) to give in and switch permanently to the new UI. If you moderate a community on Google+, it looks like you're going to get a couple of shortcuts to simplify your duties. A couple of new options are coming that will take care of those less-than-awesome posts from members that produce quality content. Both lines are fairly self-explanatory. The first allows a moderator to reject all of the posts that are still pending review. This is handy after the legitimate posts have already been checked and authorized, and all that remains is spam or otherwise unwanted material. This saves the trouble of manually rejecting multiple posts. The second line is a bit less original. There's already a "Report & Ban" command for communities, but it looks like there will be an option to also take the extra step of removing an offending comment or post that incited the expulsion of an unwanted user. I'm not entirely sure that these aren't already live, so community mods may want to take a quick look around to check for them.